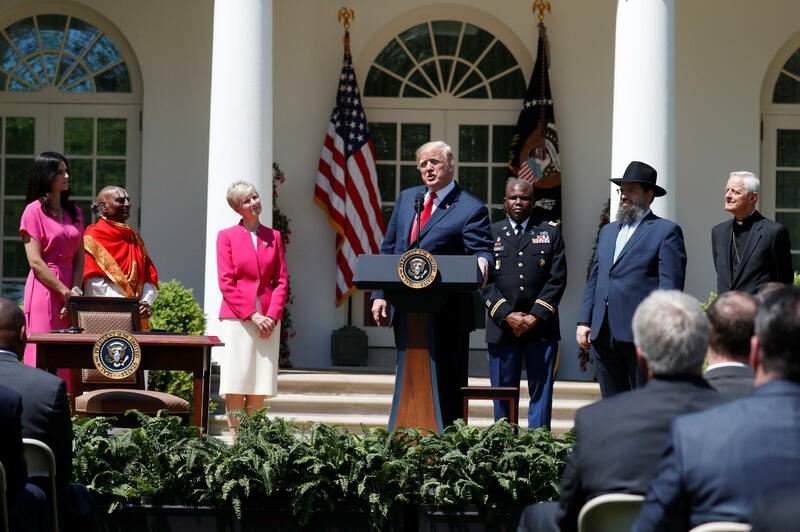 During the annual National Day of Prayer commemoration at the White House on Thursday, President Trump signed the latest executive order of his presidency, to establish a faith-based office, the White House Faith and Opportunity Initiative. He said it would focus on protecting religious freedom and ensuring that "the faith-based and community organizations that form the bedrock of our society have strong advocates in the White House and throughout the federal government." In addition to making recommendations to the administration, the office will also inform the administration of "any failures of the executive branch to comply with religious liberty protections under law." The initiative will be led by a newly appointed White House adviser to the group and will be supported by various faith leaders from outside the federal government. The order also aims to ensure faith based organizations have "equal access to government funding and equal right to exercise their deeply held beliefs." "We take this step because we know that in solving the many many problems and our great challenges, faith is more powerful than government and nothing is more powerful than god," said Mr. Trump. Last year, on the National Day of Prayer, the president signed a similar "religious liberty" executive order that would allow the IRS to opt not to enforce the Johnson Amendment, which prohibits nonprofits such as churches and charities from "directly or indirectly" engaging in a political campaign. The order, which was based on one of Mr. Trump's campaign promises, also provided regulatory relief from Obamacare requirements such as the requirement that organizations provide contraception care, which was heavily debated in the Little Sisters of the Poor case. In a proclamation released before the event, Mr. Trump said on Thursday "we join together to offer gratitude for our many blessings and to acknowledge our need for divine wisdom, guidance, and protection."